The oldest members of America's baby boom generation turn 60 this year, and for many, moving into a retirement community or a nursing home does not fit into their plans. They are going to want to grow old in the homes where they raised their families, believes Adele Cohen Segel, owner of Relocate & Renovate, who uses her interior design and real estate expertise to help seniors live active and self-sufficient retirements in their own homes. 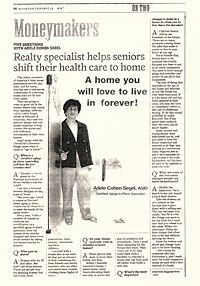 As published in the Houston Chronicle on June 30, 2006. Click here to read the full article.